Costa Rica is a famous whitewater rafting capital of the world due to its abundant raging rivers and thriving adventure attitude! You won't want to miss out on this thrilling Costa Rican activity while you're at the beach! Go rafting rain or shine - you're going to get wet anyway! 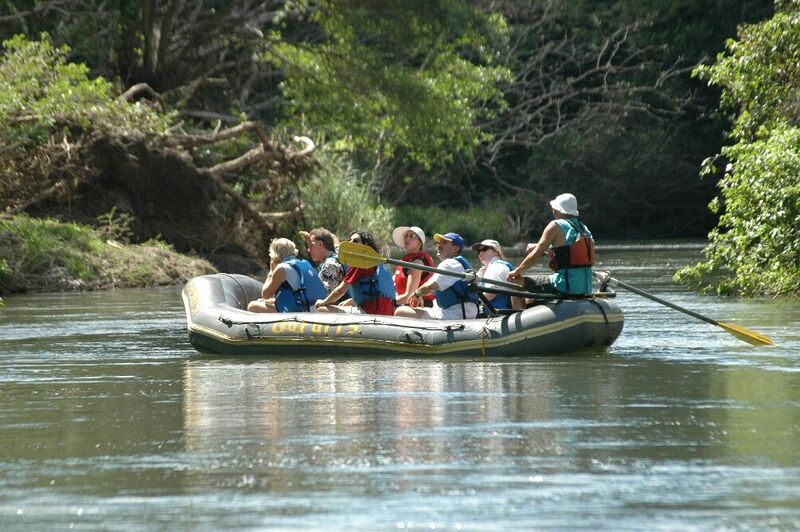 If you are looking for a real white-water rafting adventure in our Guanacaste area then this is for you! We will enter the upper section of the Tenorio River and raft down the fun rapids of this beautiful Class 3-4 river along jungle shores and lots of wildlife to be see along the way! We will be around 2hrs on the water and get hands on with the rafting experience – no worries, no previous experience is required! After this fun filled and refreshing morning we will get a strengthening Costa Rican lunch and return to the beaches. *This is an adrenaline filled trip surrounded by untouched nature! This is our closest trip for rafting and is an easy river with fun rapids that is perfect for anyone wanting to experience the excitement of this activity! On 2-person rafts (one guide/one guest ratio) we will take this fun ride down the Colorado River for about 45-60 mins and enjoy the beautiful scenery of forests and canyon along our trip on the water. After the fun we will get treated to a delicious lunch buffet and return home early so you can enjoy the rest of the day at your leisure! *Lots of fun on this short journey into the wild Costa Rica! A trip that can perfectly be added-on to our Adventure Combos and most of the Nature Trips (by request)! With a focus on spotting wildlife we will be floating down the calmer sections of the pristine Tenorio and Corobici rivers during 2hrs while our guide will be doing the rowing and let us enjoy the beauty of the scenery! Bring your cameras as you can expect to see lots of birds, lizards, monkeys and other surprises! After returning from the river we will have a great lunch “Casado” and then visit a beautiful waterfall where we can take a refreshing swim before we return home early afternoon. *This is a safe, easy and fun trip for all ages with lots to see!